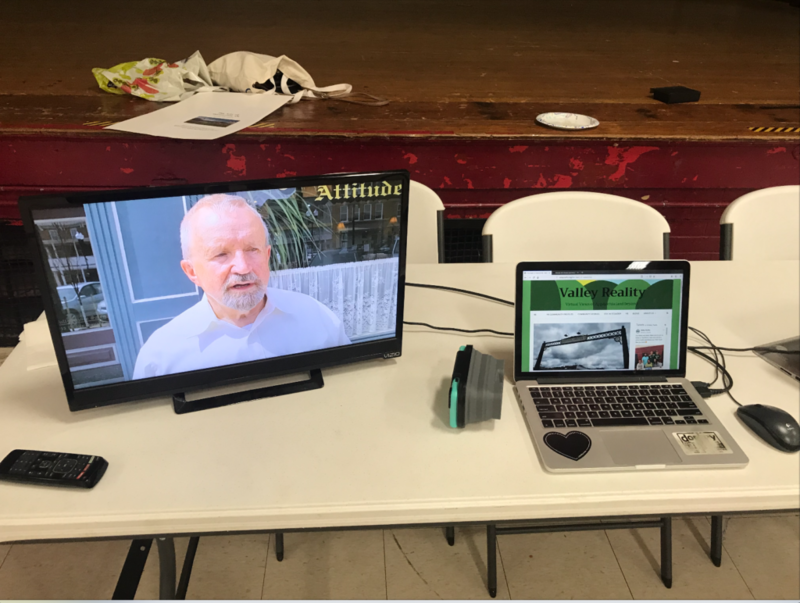 Attendees could view local communities, such as The Plains and Nelsonville, using virtual reality technology at the Valley Reality Showcase. The Valley Reality Showcase took place on Sunday, April 14, at Albany Café. During the event, members of different teams presented their final projects, showcasing several communities surrounding Athens, Ohio, and Ohio University. Albany Café, known for their famous “Sweet Potato Waffle Waffle Fries,” was the perfect place to host the event. The location itself even brought in a handful of people to see the communities that were presented on. A couple who passed through had actually attended school in the used-to-be elementary school where the Café is located. The Plains was showcased in two separate ways. One team focused more on Athens High School and the devastation that occurred in 2010 from a tornado. The tornado ripped apart the football stadium where most of Athens High School’s history took place. The football team is an important part of the community of The Plains and is the reason a major restoration project was put in place to fix the stadium and put in a new scoreboard and weight room. The city streets of The Plains were also shown through 360-degree technology. It highlighted Eclipse Company Store, a local hotspot for beer lovers, and Gigi’s Country Kitchen for breakfast lovers. Both restaurants serve not only Plains residents but are also popular with Ohio University students as they are just a short 10-minute drive away. Farther away from Athens, towns such as Albany and Nelsonville were also shown through virtual reality technology. Albany, which is home to the Café where the event was located, is an interesting town. It is the home of Alexander High School, a rival to The Plains’ Athens High School. One interesting and funny piece of the Albany project is they mentioned that the town has just one traffic light. Just that fact alone shows how small and tightknit the community of Albany was. Nelsonville is almost the same way. Fritz Bookman, owner of the Attitudes Hair Design said that they could run a “great gossip column” from all of the talk that goes on in his shop. Everyone went above and beyond, showcasing the great communities around Athens and making the second annual Valley Reality Showcase a hit.